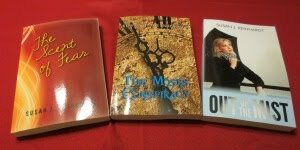 You've each won a Kathi Macias book! I've also emailed you. Please send me your snail mail address, and I'll get the books out to you ASAP. Thanks to everyone who entered the giveaway. In a few weeks we'll be doing another for my third blogoversary. Congratulations to the winners! I can't see the top of the post, so don't know who won, but if it's me, you have my addy. Wait, just save yourself some dollars and give me my prize when I see you in August. And if it's not me, whomeever won will be greatly blessed by Kathi's writing. Sorry, you didn't win. Chatty Crone and Susan Panzica won. Thank you so much for your generous gift!! ps - I have a problem with seeing the top of your posts too. The problem with seeing the top of my posts has been traced to my blog header. It's covering part of the text. Until I can get a new blog skin, I'm stuck with this header. For now, the best way to see the whole post is to click on "Show Original Post" at the top of the comments section. Sorry for the inconvenience. Thank you so very much for the book! I am so excited. You are so sweet to do this for us. Thank you again!